Lesson 2: Learn & Do! Goal: Customize your profile by choosing or uploading a profile image. Below you'll find each step for uploading your profile image described in detail, with screenshots, and at the bottom of the page, you'll find a video illustrating the process. You are strongly encouraged to utilize both the written directions/screenshots AND the video to best prepare for the Lesson 2 Quiz. STEP 2: Click on the word ‘Profile’ in the top left corner of Edmodo. 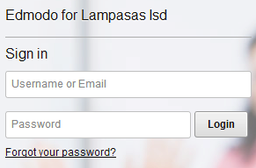 You will see this on any page in Edmodo, as long as you are logged in. STEP 4: Click ‘Choose File’ to browse to the profile picture you have already created and saved. NOTE: If you haven't already created and saved this profile image/picture, click here to take care of that before browsing to find it! STEP 5: Once you've saved your new profile picture, you should see it visible in the top right corner of any page within Edmodo (which is also an easy way to see who is logged in to Edmodo at any time). You'll also see your picture in the top left corner of your Home screen. Watch the video to see the profile image upload process!